So your friend is getting hitched and you are looking for something unforgettable to do to send them off with? 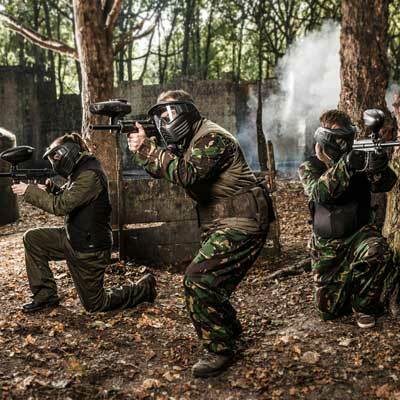 Bring out everyone’s inner Rambos and get stuck in on our unreal Paintballing battlefields before heading off for your evenings entertainment. Fancy dress is of course encouraged and we can even run a selection of specialty (and totally epic) ‘stag run’ games for your group to end your event in style! We like to do things differently – You’ll get the best, hand picked equipment and professionally designed game maps for the best experience possible! A free 9" Pizza Hut pizza and a drink is included per person within your chosen ammo package, keeping you well fuelled until home time. 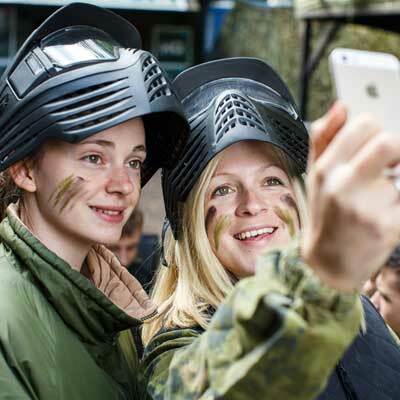 We genuinely care – providing the safest, most fun and most personable Paintballing experiences possible for our guests, and are so proud of the feedback we receive. Ideal location for London, Surrey and Kent. 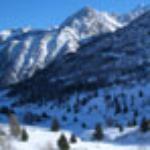 We are a 25 minutes train ride from central London and only 5 minutes from the Surrey stretch of the M25. The first venue in the world to offer professional level beastly Etek Assault Rifles and sharp-shooting Etha Sniper Rifles – choose a weapon that suits your style! On your event day, each individual to choose an amount of ammo to suit their own budgets, whilst taking part in the same games together. 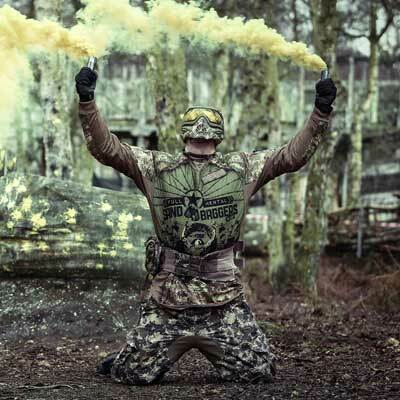 Extra 100 paintballs = Packages at £5 per 100! You’ll now get 100 extra paintballs on all of our packages. 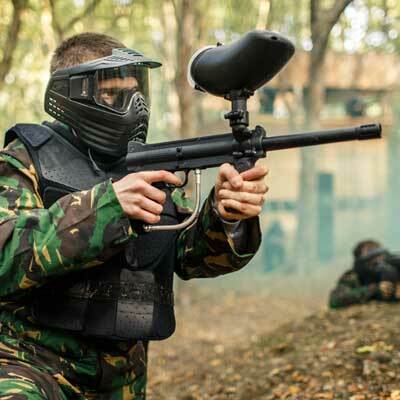 Where other venues comparably charge £9+, our paintballs on packages are £5 per 100. The best standard issue rifles, ‘Anti Fog’ goggle systems and camo overalls. Body armour is also available for free. 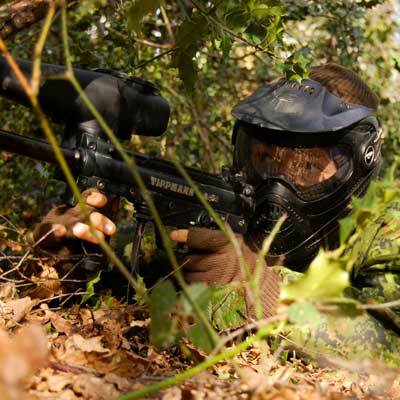 We run full days on public weekend events for the best Paintballing experience – you’ll play 8 varied games over 4 of our epic game maps! Prices per person – 2 easy payments! To make it easy and keep the initial cost down for you as the group organiser, you only need to pre-pay each player’s Full day venue Admission and Equipment hire, to book your event and reserve your spaces. On your game day, each individual selects which of the below Ammo packages they would want to go for, depending on individual budgets and how stuck in they want to get, and pay for it on the event day. This means there no need to pre-pay ammo to get the best prices, yet still getting full flexibility for each player to budget their own day. Now including 100 extra Paintballs, a 9" Pizza Hut pizza lunch and drink! You’ll be armed with the best gear, led by events experts and targeted by your mates. It’s time to clock in to the battlefield! I went recently for a stag do. Staff were great dealing with us on a busy day with a mix of adults and kids. Also people where English wasn’t their first language. Really professional and well run place (they take safety very seriously). Different arenas to try out, won’t get bored. Lots of gun upgrades and grenades. Went to my cousins stag do, mixture of ages from 18-60. Absolutely brilliant day, also well organised by fantastic, efficent, enthusiastic staff.